Living the metaphor of a road trip, I set out from New York for Albuquerque. I’m not sure when the enormity of this decision hit me. I know that sitting in traffic on the Cross Bronx, which was all stop and no go, only made me feel pleased that I’d never be stalled for two hours on that three lane parking lot again. No more being mocked by the traffic signs reminding me to go no faster than 55 mph. A hint of nostalgia started as I crossed the George Washington Bridge for what would probably be the last time. A trip full of “lasts” is bound to create a sense of life-altering change. And I had certainly shook up my life so completely this was a bridge-burner for certain. I sold my house, packed up the dog that I inherited when my son moved out, and left the only place I had ever lived. A third generation New Yorker was becoming a first generation New Mexican. Somewhere in New Jersey I realized how insane this whole idea was. 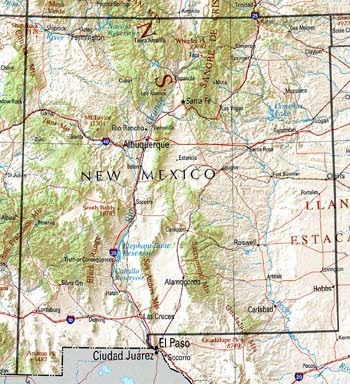 I had sold my house, quit my job and left a lifetime of friends in New York — and was moving to New Mexico where I knew exactly two people. I would move initially from a house to an apartment while I pondered my next step. That really wasn’t much of a plan. I was moving to Albuquerque. That was my plan. But there’s something about long distance driving that is much like meditation. There are no thoughts, no considerations. Life is stripped down to keeping the car between the white lines. The meditation of the road, the focus on the moment took over. As I crossed Pennsylvania I began to breathe. I was finally finished with the nuts and bolts of dismantling my old life — the sorting through decades of priceless debris, and the days of packing, hours of saying goodbye to all the people and memories and places. It all faded in my rear view mirror. There was me, and the road. It was no longer a metaphor; it was now a reality. I was on a life-changing journey. It occurred to me that the antidote to fear is to live in the moment;therefore I remained firm in the belief that if I just kept going down the road, literally and metaphorically, I’d arrive at my destination. It would just have been nice to know what that final “destination” really was. There was a lot of faith involved in this trip. “Are you driving by yourself?” people asked in horror when they discovered I planned to drive to New Mexico. Apparently a woman armed with a cell phone, roadside assistance, traveling the interstate highway is considered an intrepid traveler, akin to those hardy folks who drove Conestoga wagons across the plains. “Of course not,” I’d reply with a bit of a drawl and a hint of the devil in my voice. “I’m takin’ my dawg.” Max, is a 14-year old AKC registered Bichon who, in deference to his age, I sometimes call “my little old man.” Max and I hit the road and my first lesson was, of course, that you can’t bring dogs into restaurants. Of course I knew it — I just hadn't really thought through the implications. My next challenged was to find pet-friendly hotels, and to program enough time into my daily itinerary for the search. My first attempt in Bloomsburg, Pennsylvania didn’t go so well. “Can I have a room for the night for me, and my cute little white fluffy dog?” I asked the desk person at one of the national chains. No apparently not. But she did suggest the Econo Lodge just down the road that is pet friendly. When traveling with a pet, never take finding accommodations for granted. Eventually the road took me through Kentucky. 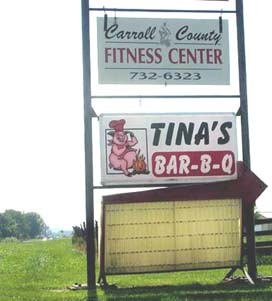 I’m a BBQ freak and I know that Kentucky has some fine places. Overdosed on fast food road food I randomly took an exit in Kentucky and stumbled onto Tina’s. Tucked next to a fitness place the food was fantastic. The shredded beef was peppery delicious and the pulled pork was beautifully smoked and served on toast with mustard slaw. We sat out on the tiny terrace and both Road Dawg and I loved that meal. But once again, there was this dawg thing and the need to find a pet-friendly lodging. It’s one of those open secrets that tourist information and welcome centers — that, a touch too late and after the fact, you remember seeing a few miles after crossing state lines — have information on hotels and often a phone for you to use to make reservations. The hotel information often includes whether or not they are pet-friendly. Actually that’s a bit of a misnomer. They are rarely friendly towards pets, they more or less tolerate them. But that’s okay. Sometimes I feel that way about Road Dawg too. Crossing over from Kentucky into Tennessee I decided it was time to get a little assistance and abandon the hit-or-miss approach to the hotel search I had been using. I wanted to stay in the heart of Nashville and experience the flavor of the city, if only for one evening. The very helpful Nashville greeter went down the list of pet-friendly places indicating which were also located in the center of town. That narrowed the list down from many properties to just two. I chose the Sheraton. This was the only place I stayed that made me sign forms about my dog-owning responsibilities, including the promise not to leave my dog alone in the room. Despite my qualms about promising my life away, the staff was wonderful. Especially wonderful was the concierge service. The two enthusiastic ladies heard my plea for barbeque and tracked down Jack’s. A place with an outdoor dining patio that would actually allow me to eat their unbelievable ribs — with Road Wag at my side. Jack’s BBQ had smokey, meaty, fall-off-the-bone tender ribs. They have three sauces: vinegar-based tangy Tennessee style; mild, sweet & smokey Kansas City: and ... but truly it isn’t necessary to do a thing to these perfect ribs. 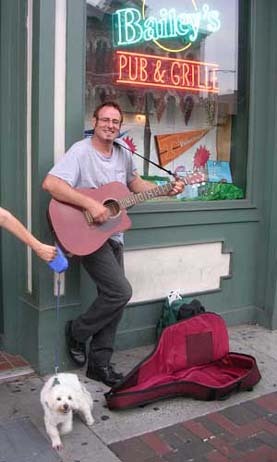 Afterwards, Dawg and I strolled down Broadway where the music poured out of the doorways in a way that reminded me of the French Quarter of New Orleans. Honky tonk, hill billy, blues and more. The downside of traveling with a dog was that I could only stand outside and listen, but cute little dogs also attract attention. So it was that I met Roger, a street performer who couldn’t resist Road Dawg. Setting up for his performance just around the corner Roger initially feigned terror on seeing Road Dawg and therefore became an instant playmate. Had we been in town for breakfast or lunch we could have gone to The Arcade which had outdoor tables appropriate for human-dog meal-sharing. I think there must be folks for whom the basic notion of a road trip resonates deeply. But for others, it must just be seen as a necessary method from going from point A to point B. For me, however, there’s something magical and other-worldly about edging my way onto the open highway just as the early morning mists on the fields begin to glow with the light of the rising sun. On this particular day, the road cut through the heart of mountains and opened onto green valley. I was reminded that the United States is a huge country; and it’s hard to really appreciate its size unless you drive through it. As the miles of lovely green rolling hills unfolded like a scroll, I began to scan the sides of the road for ... billboards. Usually considered a visual blight, on long distance trips, and in small doses, they provided me with reading material and sometimes bits of information; not just the ones telling me about the fantastic prices of motels, delicious meals to be had in various restaurants, and amazing attractions up ahead, but there were also those seeking to save my soul. “If you died today where would you spend eternity?” asked one billboard. And the next one answered that rhetorical question with the admonishment that “Hell is real.” Further down the same road I passed a sad-looking bar in a squat concrete building above which an equally sad sign announced “Adult Motel & Gentlemen’s Club.” Other signs proclaimed themselves as the birthplace of someone famous. At the very least, the disparate signs made for enjoyable visual breaks. Crossing into Texas things changed quickly. 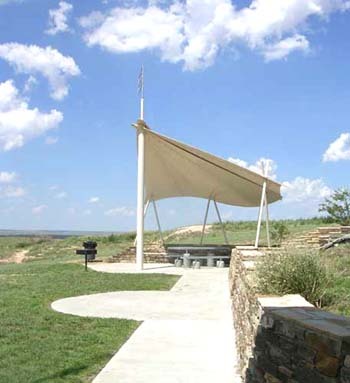 The rest areas in Oklahoma had generally been few and rather barren; perhaps because of the blistering heat and lack of water. In some parts the roads were so choppy my tires made a thump thump cadence across the patched pavement. In Texas, you could easily tell that it is a more prosperous state. The rest stops are architectural creations. And the bathrooms in the visitor information center (the latter was oddly located more than halfway through the state) had high ceilings and beautiful tile walls and floors — and even stone countertops. Stopping in Amarillo for the night so I could have Texas BBQ, Max and I checked into a Quality Inn. By now I knew to stop when I saw a welcome center and pick up a listing of hotels. As I drove through Amarillo I made sure to check the listings of hotels that looked good to make sure they were pet-friendly. And Amarillo was a pet-friendly town; I had no problems finding a hotel. Along I-40, Texas has two offbeat tourist attractions of note. One is billed as the “tallest cross in the western hemisphere.” It is indeed very tall. And right beside it is the Virgin Mary restaurant. 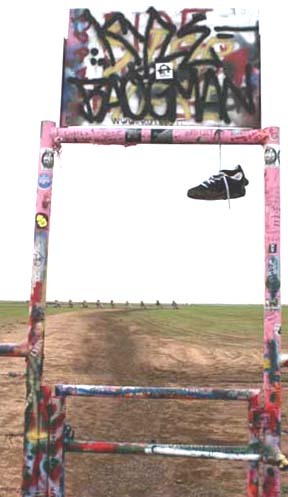 The other offbeat attraction is Cadillac Ranch, an unusual public art installation and sculpture. It is much harder to spot. You’ll need directions to find this place. Frankly, I stopped in Amarillo for the BBQ not because of the attractions. I was getting close to my new home state and was therefore running out of time to fit in a real Texas-style BBQ. I wasn’t disappointed. The sign above the restaurant proclaimed Dyer’s Bar-B-Que “a genuine smoke-em place,” and the aroma was unmistakable. I happily followed it inside. Ribs are Dyer's specialty, but Texas and brisket go together like Maine and lobster. The happy solution was their combination platter. The next morning Road Dawg and I cruised into the Land of Enchantment.